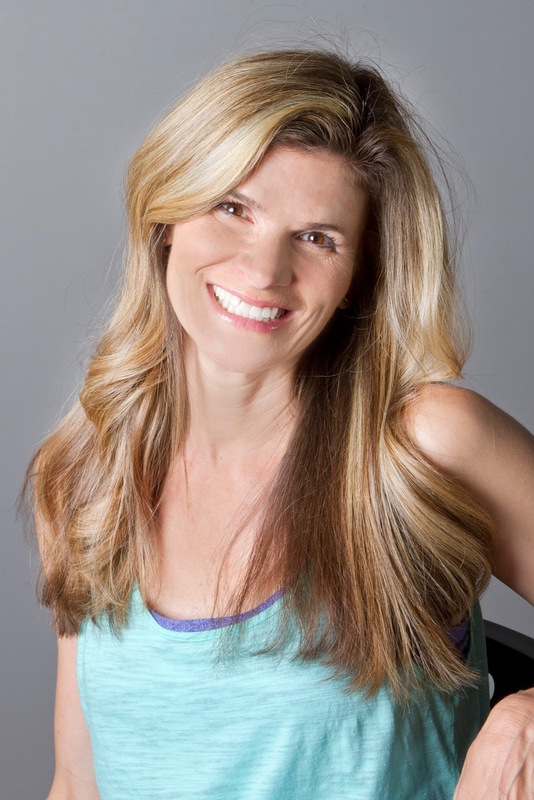 Today we have the pleasure of featuring author Kim Tomsic! 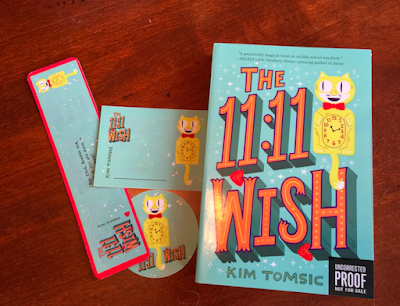 Kim is giving away a copy of her debut MG novel, THE 11:11 WISH (Katherine Tegan Books/Harper Collins, Feb. 13, 2018) plus additional swag. Be sure to enter the Rafflecopter at the end of her interview! I read to my children every night and fell in love with everything Richard Peck wrote. When I ran out of Richard Peck books to read, I promised my son I’d write one, and so began my writing journey. 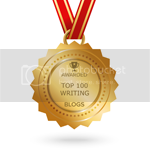 I spent the next year writing a novel and then had it professionally critiqued. I thought it was ready—good to go! The critiquer was kind about finding nice things to say, but she also gave me very specific reasons why I was not at all ready to approach an agent or publisher. I took copious notes and then asked the most important question of my publishing career, “Is there an organization I can join so I can learn more about craft as well as the business of publishing?” She directed me to the Society of Children’s Book Writers and Illustrators. I joined SCBWI immediately—best decision ever! Through this organization, I found my critiquing group, learned about voice, discovered verbs really needed to do the heavy lifting, met my agent, and learned and practiced about 77,000 tips and tricks. Congrats on your debut MG, THE 11:11 WISH ! Tell us about it and what inspired you. Thank you! 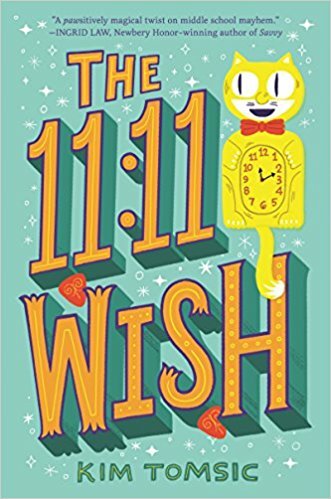 THE 11:11 WISH is about a seventh-grade math whiz who discovers an enchanted cat clock and uses magic to try to fit in at her new school only to discover wishing can have catastrophic consequences. You also have a picture book (or more) forthcoming. Tell us about those. I never wrote the Richard Peck book for my son. Come to find out, there can only be one Richard Peck. But my narrative nonfiction picture book, GUITAR HERO (Chronicle Books 2019) is dedicated to my son, because it was while spending hours and hours with him, shopping for a guitar that this idea came to light. GUITAR HERO is about Les Paul and his many inventions including the solid body electric guitar, but more importantly it is a story about perseverance. When Les (little Lester) was a child, his piano teacher pinned a note to his shirt informing his mother that Lester was not musical and she should save her money! Fortunately, Lester had grit and a mother who believed in him. Les Paul—the same guy who was told he’d never be musical—went on to win seven Grammys, invent sound on sound music, the eight-track tape recorder, and several ground-breaking discoveries in sound that changed the landscape of music. I can’t tell you how much I love his story! In 2020, I have another narrative nonfiction picture book coming out with Chronicle Books. Gosh, please don’t take this as vain, but I’m in love with this story, too. How could I not be—it’s all true—a story of trust about a man and a herd of elephants and the incredible friendship they formed, plus how that friendship came full circle at a critical moment. Do you find it difficult to move from one age group to another in writing? Which did you write first in your writing journey? For some magical reason, I did not find it difficult to go back and forth between my middle grade novel and my picture books. Still, I must admit, the voice in my head is a 12 to 13-year-old, so I don’t imagine a YA novel in my future unless I grow up! Ha! I completed my first manuscript in 2009. I love looking back and seeing how terrible that novel is—I mean really terrible—because it shows me how much I’ve learned and how far I’ve come. I love Steve King’s book, ON WRITING, but when he says writing can’t be learned, I strongly disagree. I needed a writer’s education so I could find my writer chops. That meant attending classes, workshops, conferences, and working with a critiquing group. I started working on THE 11:11 WISH in 2010, but I didn’t find my writing chops for it until 2015. In the middle of figuring out that novel, I wrote and sold my elephant story in 2013—yep, the same one that comes out in 2020. I also wrote, finished, and sold Guitar Heroin 2015. I had to keep shelving THE 11:11 WISH until I figured out some plotting points, but it was through sticking with that novel that I was present and active for the other stories that showed up. In 2016, THE 11:11 WISH was exactly where my agent and I wanted it. It sold right away. I’d say get an MFA! Join SCBWI! Read your genre! Learn structure! Pay attention to story beats and how the brain processes story, noticing what works and what doesn’t. Check out screenwriter methods! Read SAVE THE CAT! Most people in my writing world don’t know that I teach yoga. Oh,and they probably don’t know that my favorite food is oatmeal. Mmm-mmm, I love a good bowl of slow cooked oatmeal! When Kim Tomsic was a kid, she wished for roller skates, a racetrack, and the ability to fly. Her wishes came true! The roller skates showed up with a big red bow; the SpeedTrax slot car racetrack was owned by her brother (thankfully he shared); and flying…well, if she squeezed her eyes tight enough, a good bounce on the trampoline felt as magical as a set of wings. Kim still loves wishing at 11:11 from her home in Boulder, CO which she shares with her husband, two children, and two dogs. If she’s not busy writing, she can usually be found teaching a yoga class or walking the trails of Wonderland Lake. Kim’s debut middle grade novel, the THE 11:11 WISH (Katherine Tegen/HarperCollins), releases on February 13, 2018. Thank you for the great interview! The advice about education is so valuable for writers. I can’t wait to read The 11:11 Wish! Excellent interview and writing advice! I look forward to reading this book and learning from it, as I continue this writing journey. Thank you. Thank you, Linda! Keep at it. 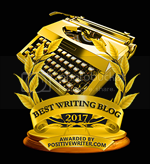 The writing journey is worth it! Omigosh, the cover is so cool and fun! I think I need a magic clock myself! I'm in love with the cover, too! It's so cool to see my childhood dream-clock come to life! I remember wishing at 11:11! What a great idea for a book! This book sounds so much fun. I'm excited to read it--the cover brings back memories of my favorite cat clock as a small child--our neighbor had it and I loved watching it tick off the day. Happy memories for me. I'm a musician and math nerd, so Guitar Hero and The 11:11 Wish look amazing to me! Congratulations. Oh, yes! And as a musician, there are a few surprises in The 11:11 Wish for you, too! OMG! I love this cover! We had a black, cat clock just like that when I was young. You actually owned one of the black and white cat clocks!!!!!!!!!!!!!! You're my hero!!!!!!!!!!!!!!! I remember the cat clock! Never had one when I was young, however, a friend of mine did. So cool. I also remember hearing the story about the piano teacher pinning that note on Les when he was a child...always thought "how cruel". And who doesn't love elephants! They never forget anything...almost a magic power in itself. Thank you for the wonderful post. Brought back some great memories!! Hooray hooray hooray!!! I am so excited for your debut! Congratulations - this is well-earned!